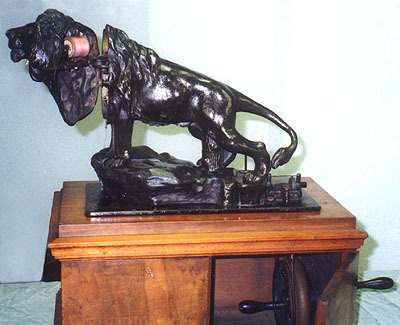 The Scottish firm of Kimball & Morton revisited the lion form during the early 1900s. The example here shows the machine in its hand crank version, priced at 8 guineas. Treadle and cabinet versions were also available at increased cost. The casting was styled after an original work of art by J. Vasteugh Gyorgy. collection - London Sewing Machine Museum.